'AbgDuke' is once again a space-station (I have received quite many space levels lately). When you begin the level you'll first notice a gray nukebutton in the same room. You have to travel through the level to press a button that opens a forcefield that protects nukebutton. 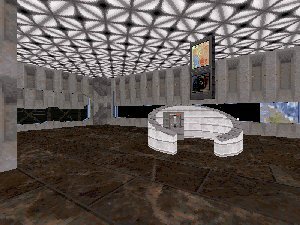 You'll travel your way through water, computer rooms, corridors floating in space etc. On the outside there's a spaceship scouting around the level just like the one in E2L1 (but this one isn't shooting). Design is below average. It gets poor sometimes and has many texture bugs (texture bug is a sign of a newbie level). There's nothing wrong with the level - it's fun and puzzles are well constructed but the overall design of the map is not so good. It ain't empty (neither it's detailed) or shadowless but it just looks like the ones I did four years ago.